Substitute Tomas Necid scored the equalizer from the penalty spot deep into stoppage time. Czech Republic came back from two goals down to salvage a 2-2 draw with Croatia at the European Championship on Friday in a game that was marred by a temporary suspension when flares were thrown onto the pitch. Substitute Tomas Necid scored the equalizer from the penalty spot deep into stoppage time after Domagoj Vida was penalized for a handball. Goals from Ivan Perisic and Ivan Rakitic had given Croatia a well-deserved 2-0 lead before Milan Skoda ensured a nervy finish when he pulled one back in the 76th minute with a powerful header from Tomas Rosicky’s perfectly judged cross. The game was then delayed when flares were thrown onto the pitch from the Croatian fans end. 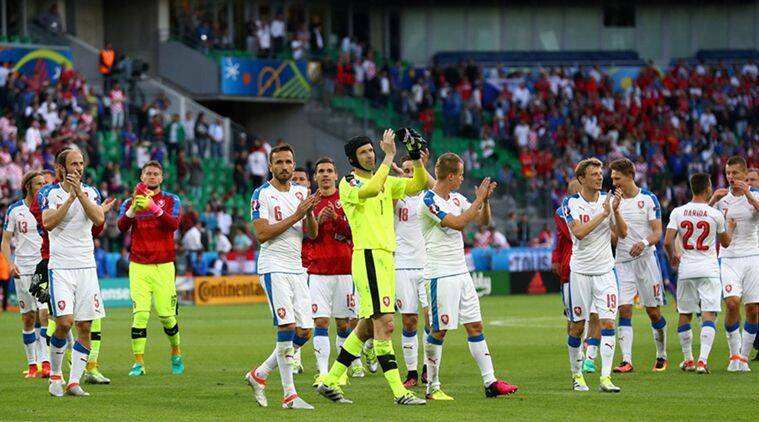 Ivan Rakitic and Croatia captain Darijo Snra were among the Croatian players signaling to the team’s fans to calm down. Croatia is potentially facing a big fine from UEFA over the delay. Croatia dominated for most of the game and deservedly went ahead when Perisic opened the scoring in the 37th minute after shooting past Czech Republic goalkeeper Petr Cech with a low angled shot into the corner. After beating the offside trap, Rakitic made it 2-0 in the 59th with a chip over Cech. Rakitic celebrated his goal by embracing Srna, who returned to France this week after attending his father’s funeral. Croatia leads Group D with four points, three more than the Czech Republic. Spain takes on Turkey in the group’s other match Friday.